Risk of bias can seriously adulterate the internal and the external validity of a clinical study, and, unless it is identified and systematically evaluated, can seriously hamper the process of comparative effectiveness and efficacy research and analysis for practice. The Cochrane Group and the Agency for Healthcare Research and Quality have independently developed instruments for assessing the meta-construct of risk of bias. The present article begins to discuss this dialectic. This distinction arises from a cogent articulation of the fundamental construct of translational medicine in particular, and of translational health care in general. the second translational “block” (T2) was described as “…the translation of results from clinical studies into everyday clinical practice and health decision making…” . These are clearly two distinct facets of one meta-construct, as outlined in Figure 1. As signaled by others, “…Referring to T1 and T2 by the same name—translational research—has become a source of some confusion. The 2 spheres are alike in name only. Their goals, settings, study designs, and investigators differ…” . Figure 1. Schematic representation of the meta-construct of translational health carein general, and translational medicine in particular, which consists of two fundamental constructs: the T1 “block” (as per Institute of Medicine’s Clinical Research Roundtable nomenclature), which represents the transfer of new understandings of disease mechanisms gained in the laboratory into the development of new methods for diagnosis, therapy, and prevention as well as their first testing in humans, and the T2 “block”, which pertains to translation of results from clinical studies into everyday clinical practice and health decision making []. 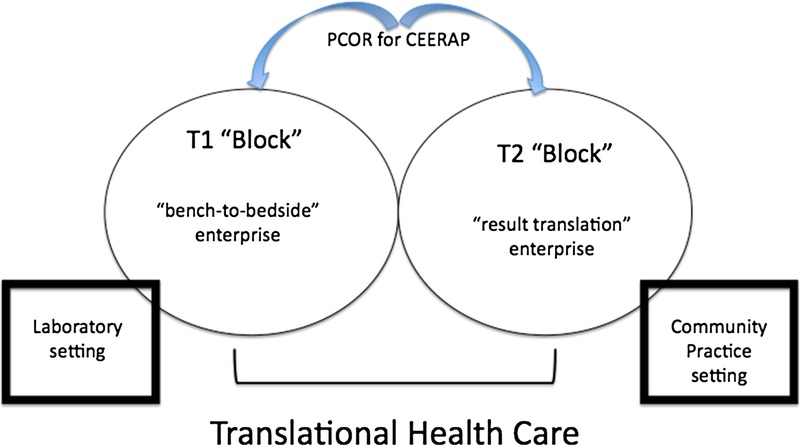 The two “blocks” are inextricably intertwined because they jointly strive toward patient-centered research outcomes (PCOR) through the process of comparative effectiveness and efficacy research/review and analysis for clinical practice (CEERAP). The domain of each construct is distinct, since the “block” T1 is set in the context of a laboratory infrastructure within a nurturing academic institution, whereas the setting of “block” T2 is typically community-based (e.g., patient-centered medical/dental home/neighborhoods ; “communities of practice” ). For the last five years at least, the Federal responsibilities for “block” T1 and T2 have been clearly delineated. The National Institutes of Health (NIH) predominantly concerns itself with translational research proper – the bench-to-bedside enterprise (T1); the Agency for Healthcare Research Quality (AHRQ) focuses on the result-translation enterprise (T2). Specifically: “…the ultimate goal [of AHRQ] is research translation—that is, making sure that findings from AHRQ research are widely disseminated and ready to be used in everyday health care decision-making…” . 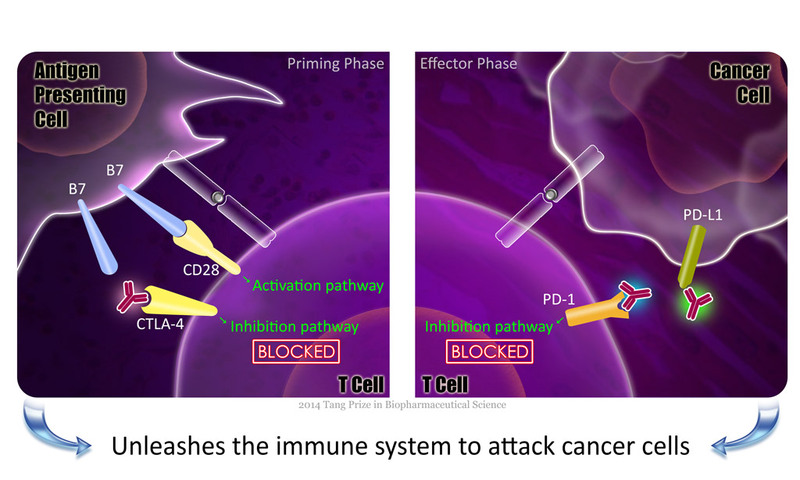 The terminology of translational effectiveness has emerged as a means of distinguishing the T2 block from T1. individualized patient-centered diagnostic and prognostic care. a community of practices network coordinated by an academic center of research. translational research and translational effectiveness can most optimally be undertaken. be utilized in evidence-based clinical decision-making, viz. translational effectiveness. most importantly on the best available evidence . translational medicine in evidence-based health care. patient (P), the interventions (I) under consideration (C), for the sought clinical outcome (O), within a given timeline (T) and clinical setting (S). in the utilization of the best available evidence in clinical decisions, viz., translational effectiveness. which emerges from highest quality research. which is obtained when errors are minimized. reduce risk of bias in research. low bias and contained risk of bias [12–15]. 6. other research protocol-related biases. 2. each item was scored high, low, or unclear risk of material bias (defined here as “…bias of sufficient magnitude to have a notable effect on the results or conclusions…” ). the studies stratified according to risk of bias . This is a form of acceptable sampling analysis designed to yield increased homogeneity of meta-analytical outcomes . Alternatively, the homogeneity of the meta-analysis can be further enhanced by means of the more direct quality-effects meta-analysis inferential model . the subjective nature of its assessment protocol. that judgments be made independently by at least two people, with any discrepancies resolved by discussion . is akin to that described by us [19,20] and by AHRQ . 2. providing a subjective and not quantifiable assessment. while generalizing the main findings across the different study facets. G theory is particularly useful in clinical care analysis of this type, because it permits the assessment of the reliability of clinical assessment protocols. it is recommended that G theory determination follow classic theory psychometric assessment. the criterion validity (r = 0.96, p < 0.05) for this instrument (Figure 2). Figure 2. 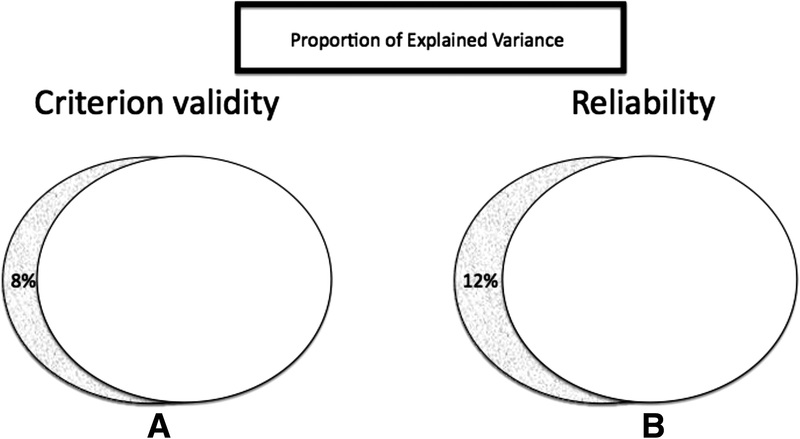 Proportion of shared variance in criterion validity (A) and inter-rater reliability (B) in the AHRQ Risk of Bias instrument revised as described. Two raters were trained and standardized  with the revised AHRQ Risk of Bias and with the R-Wong instrument, which has been previously validated. Each rater independently produced ratings on a sample of research reports with both instruments on two separate occasions, 1–2 months apart. Pearson correlation coefficient was used to compute the respective associations. The figure shows Venn diagrams to illustrate the intersection between each two sets data used in the correlations. The overlap between the sets in each panel represents the proportion of shared variance for that correlation. The percent of unexplained variance is given in the insert of each panel. •a) to train multiple readers in sharing a common view for the cognitive interpretation of each item. Readers must possess declarative knowledge a factual form of information known to be static in nature a certain depth of knowledge and understanding of the facts about which they are reviewing the literature. They must also have procedural knowledge known as imperative knowledge that can be directly applied to a task in this case a clear understanding of the fundamental concepts of research methodology, design, analysis and inference. 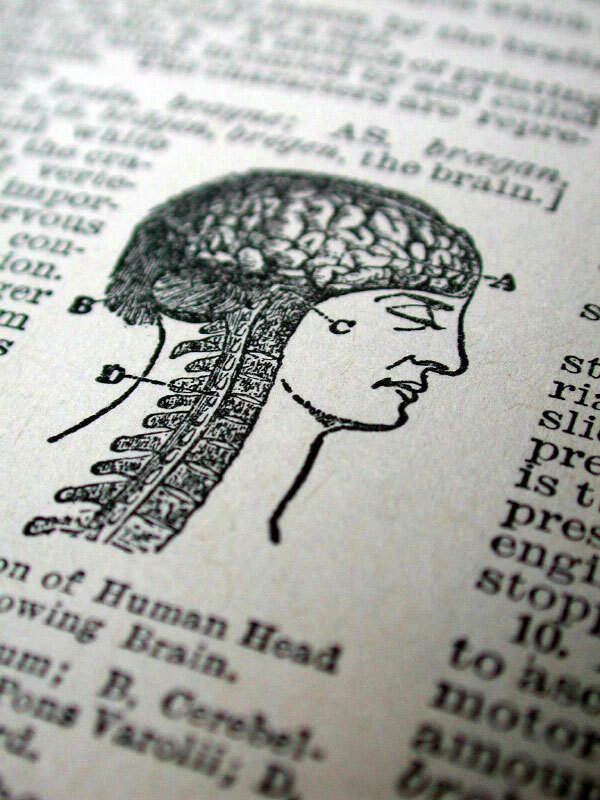 •b) to train the readers to read and evaluate the quality of a set of papers independently and blindly. They must also be trained to self-monitor and self-assess their skills for the purpose of insuring quality control. •c) to refine the process until the inter-rater correlation coefficient and Cohen coefficient of agreement are about 0.9 (over 81% shared variance). This will establishes that the degree of attained agreement among well-trained readers is beyond chance. •d) to obtain independent and blind reading assessments from readers on reports under study. •e) to compute means and standard deviation of scores for each question across the reports, repeat process if the coefficient of variations are greater than 5% (i.e., less than 5% error among the readers across each questions). •statistical analysis: accept the papers that sustain sequential repeated Friedman analysis. •executing the Friedman analysis again, and repeating the 4-E process as many times as necessary, in a statistical process akin to hierarchical regression, to eliminate the evidence reports that exhibit egregious weakness, based on the analysis of the marginal values, and to retain only the group of report that harbor homogeneously strong evidence. Jiang F, Zhang J, Wang X, Shen X: Important steps to improve translation from medical research to health policy. Sung NS, Crowley WF Jr, Genel M, Salber P, Sandy L, Sherwood LM, Johnson SB, Catanese V, Tilson H, Getz K, Larson EL, Scheinberg D, Reece EA, Slavkin H, Dobs A, Grebb J, Martinez RA, Korn A, Rimoin D:Central challenges facing the national clinical research enterprise. Woolf SH: The meaning of translational research and why it matters. Chiappelli F: From translational research to translational effectiveness: the “patient-centered dental home” model. Maida C: Building communities of practice in comparative effectiveness research. In Comparative effectiveness and efficacy research and analysis for practice (CEERAP): applications for treatment options in health care. Edited by Chiappelli F, Brant X, Cajulis C. Heidelberg: Springer–Verlag; 2012. Agency for Healthcare Research and Quality: Budget estimates for appropriations committees, fiscal year (FY) 2008: performance budget submission for congressional justification. Westfall JM, Mold J, Fagnan L: Practice-based research—“blue highways” on the NIH roadmap. Chiappelli F, Brant X, Cajulis C: Comparative effectiveness and efficacy research and analysis for practice (CEERAP) applications for treatment options in health care. Heidelberg: Springer–Verlag; 2012. Dousti M, Ramchandani MH, Chiappelli F: Evidence-based clinical significance in health care: toward an inferential analysis of clinical relevance. Campbell D, Stanley J: Experimental and quasi-experimental designs for research. Chicago, IL: Rand-McNally; 1963. Littell JH, Corcoran J, Pillai V: Research synthesis reports and meta-analysis. New York, NY: Oxford Univeristy Press; 2008. Chiappelli F: The science of research synthesis: a manual of evidence-based research for the health sciences. Hauppauge NY: NovaScience Publisher, Inc; 2008. Higgins JPT, Green S: Cochrane handbook for systematic reviews of interventions version 5.0.1. Chichester, West Sussex, UK: John Wiley & Sons. The Cochrane collaboration; 2008. McDonald KM, Chang C, Schultz E: Closing the quality Gap: revisiting the state of the science. Summary report. U.S. Department of Health & Human Services. AHRQ, Rockville, MD: Summary report. AHRQ publication No. 12(13)-E017; 2013. 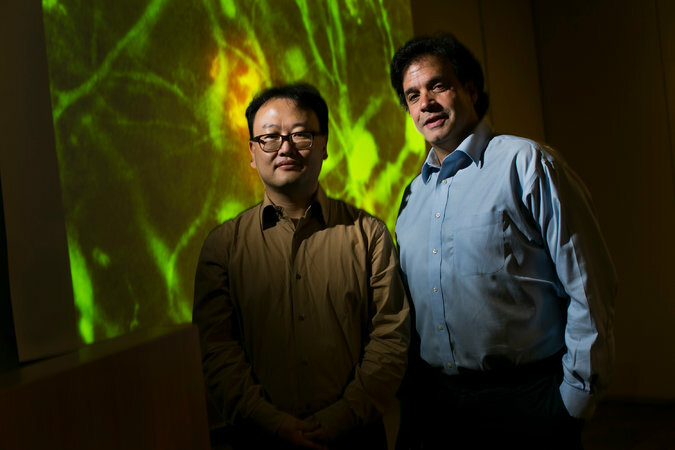 NEW YORK (GenomeWeb News) – The Stanford Center for Clinical and Translational Research and Education, or Spectrum, is being awarded $45.3 million over four and a half years by the National Institutes of Health to push forward translational research in medicine. Spectrum is one of 15 institutions to receive such an award being funded as part of the Clinical and Translational Sciences Awards, which were launched in 2006 by NIH “to help meet the nation’s urgent need to provide better healthcare to more people for less money,” the Stanford School of Medicine said. Stanford won a first round of CTSA funding in 2008 of $30 million. The new funding will be used to support two new programs at Stanford, one in disease diagnostics and one in population health sciences. The diagnostics program seeks to develop new methods of testing and preventing disease through advances in omics, immune monitoring, molecular imaging, single-cell analysis, computation, and informatics, the school said. Atul Butte, chief of systems medicine and associate professor of pediatrics and genetics, will lead the program. The Population Health Sciences Initiative will design systems to serve as a new source of practice-based evidence. The systems will be based on the daily experiences of practicing physicians and information drawn from clinical data warehouses, Stanford said. This initiative is led by Robert Harrington, professor and chair of medicine; Mark Cullen, professor of medicine and chief of the Division of General Medical Disciplines; and Douglas Owens, professor of medicine and director of the Stanford Center for Primary Care and Outcomes Research and the Center for Health Policy. 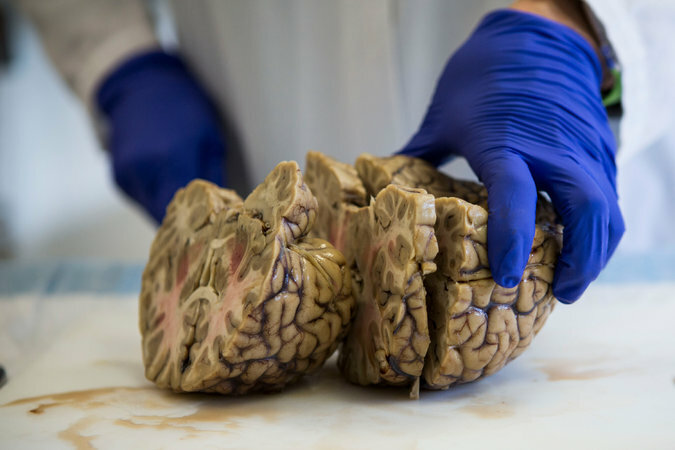 The new CTSA award also will be used to address the shortage of qualified clinical and translational researchers across the US by funding new training programs and online courses in clinical research, Stanford said.